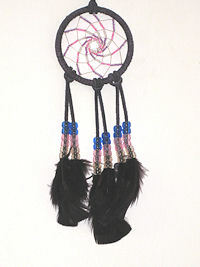 This dark purple suede leather wrapped dream catcher has a spiral pattern made with fine seed beads. Dark purple dyed turkey feathers adorn the laces. Overall length is approx 10" (25.4cm). This item can be combined with other styles in this category that are the same price to qualify for quantity discounts. Our catalog will automatically figure the correct discount levels at check out.